Following a catastrophic event, Candi Sparks created the "Can I Have Some Money?" financial empowerment series. 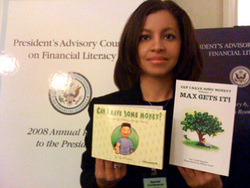 Her work in financial literacy was recognized by the U.S. President's Council for Financial Literacy, and she has been featured as a children's money expert by Parents.com, iVillage.com, Black Enterprise, The Atlanta Post and is a regular contributor to NY Parenting Media and other media outlets. Candi is a mother of two and lives in New York. Money doesn't come with instructions, neither do kids. But money is a family matter. My journey has led me to look at money in a generational context. If adults don't know how to handle money, how can the kids? Let's be proactive in helping young people get the financial education they need and deserve. It is always a good time to be financially proactive. Can I Have Some Money? is life saving financial planning for kids.